We’d love your help. Let us know what’s wrong with this preview of Ragan's Song by L.A. Remenicky. Ragan returned home to celebrate her parent’s anniversary hoping they would forgive her the secrets she’s kept from them over the last few years. When she discovered that Adam was still living in Fairfield Corners she hoped her secrets were safe, secrets that drove her away three years, secrets th It only took one look into his eyes for her to know she was in trouble again. To ask other readers questions about Ragan's Song, please sign up. For 167 pages, this book sure packs a solid punch. I have to admit, I was sold at ‘rockstar’ and ‘second chance’ romance, but this book is difficult to put into any category. Filled with twists and turns, it also has paranormal elements in it. Although paranormal is not my favorite genre, this book completely drew me in from page one and didn’t let go. Told at a breakneck pace, we meet our heroine, Ragan, returning home after a three-year absence with her young son in tow. A freak accident puts her in the path of the very man she left town to avoid. Ragan’s return opens a Pandora’s box: family secrets, competing love interests, will she or won’t she, and answers to my ‘what happened in the past’ questions. This is the first book I have read by Ms. Remenicky, but it won’t be the last. She has a beautiful writing style and the ability to put a very full story into a short amount of pages. There were plenty of giggles, guffaws, and red herrings to keep me entertained. The chemistry between the characters was fantastic and I am left wanting more. Even though I have never read the first book in this series, I really liked it. It captured me from the very beginning and it was hard to have to put the book down to finish my housework chores. I am looking forward to the third book to see what else happens to the characters living in the town of Fairfield Corners! I read this one in one sitting, it was that amazing! From the start, the story grabs you and keeps your full attention throughout. Lot of twists, and turns with one of the best love triangles ever. Adam and Ragan are great characters, and a happily ever after fulfilled my reading needs. Ragan’s Song is a superb second chance romance. Ragan and Adam get a second chance at love after a near tragedy. Jilted lovers and stalkers try to keep them apart but to no avail. Cute part of the story is where Jenna (Adam’s daughter) tries to play matchmaker. Regan left Fairfield Corners three years ago leaving without explanation to Adam. She returns in the middle of a snow storm, a deer runs out in front of her, she swerves to avoid hitting it, loses control of the car, goes into the river. This was by Adam's house, he see it and rescues her and her son. She is taken to the hospital and the doctor treating her is her twin brothers life long best friend. There is quite a bit of history, hard feels among some of the characters. Regan must be honest wi Regan left Fairfield Corners three years ago leaving without explanation to Adam. She returns in the middle of a snow storm, a deer runs out in front of her, she swerves to avoid hitting it, loses control of the car, goes into the river. This was by Adam's house, he see it and rescues her and her son. She is taken to the hospital and the doctor treating her is her twin brothers life long best friend. Wow! I was looking forward to this second book and it definitely did not disappoint! This second book picks up over three years after the last one so we have missed the entire relationship of Adam Bricklin and Ragan Newlin but we get glimpses of it through memories of each of them. For Adam the hurt remains strong of Ragan leaving him with no reason and out of the blue. Yet Ragan has come back to town and Adam is the first person she sees due to a car accident that Ragan and her son Skylar are in Wow! I was looking forward to this second book and it definitely did not disappoint! Yet Ragan has come back to town and Adam is the first person she sees due to a car accident that Ragan and her son Skylar are involved in. But now that Ragan is back, Adam is looking for answers and Ragan can't give them to him. Will Ragan be able to keep her secrets hidden and as she grows closer to the local doctor, Mark, will she be able to put her past with Adam aside? I loved this book and all of the secrets that came with it!! Ragan really thought she was doing what was best by leaving, yet the past still haunted her and she was unable to really move on from those events. Yet those mysteries were still there when she returned. Adam is still awesome and I loved the little things about him, like how he is an excellent father to his daughter. He has no idea how much Ragan wanted to protect him and it's sad what it cost them all! Wow this book had me hooked. This is second book to Fairfield corner. We meet Reagan, who left town three years ago running from love of her life. She returns to town for her parents wedding anniversary, but on her way back with her son Skylar, she flips her car into a lake after dodging a deer in a storm storm. This changes her life. Running from her dark secrets. We meet Adam, his a rockstar now living in Fairfield Corner to be near his cousin and raise his daughter Jenna. His trying to mend his Wow this book had me hooked. We meet Adam, his a rockstar now living in Fairfield Corner to be near his cousin and raise his daughter Jenna. His trying to mend his heart after Ragan left without a word to him in the middle of the night. He has a song in his head what disappears everytime he tries to concentrate on the song hard. His life turns upside down when Ragan arrives back in town and saves her and Skylar from their car. What is Ragans dark secret? Will Adam ever be able to find that elusive song? Who is Skylar? This book made me cry when needed too. I bit my nails and sat on edge of seat wanting to know what happened. This book is a must read. I laughed and cried, it was so good! This book hooked me in from the beginning. It is a second chance love story with love, fear, loss, and a touch a mystery. You are drawn to the characters immediately and you feel like you there in the book with them. Ragan ran away - primarily because she was scared to fall in love but also because she receives some shocking news about her boyfriend. She has a secret that no one knows about as well and when her parents celebrate their wedding anniversary all the old lies and secrets coming bubbli This book hooked me in from the beginning. It is a second chance love story with love, fear, loss, and a touch a mystery. You are drawn to the characters immediately and you feel like you there in the book with them. Ragan ran away - primarily because she was scared to fall in love but also because she receives some shocking news about her boyfriend. She has a secret that no one knows about as well and when her parents celebrate their wedding anniversary all the old lies and secrets coming bubbling to the surface. Adam is the rockstar that got all the ladies. But he only wanted one. To bad she was no where to be found. Never a goodbye or a postcard, she was just gone. He learned to live with it but when Ragan show's back up in town his world flips upside down. The love and chemistry between these characters is perfectly written. Ms. Remenicky leaves you with all the feels and wanting more. I cannot wait for the next book. Ragan's Song (Fairfield Corners Book 2) by L. A. Remenicky has many mysteries, twists, a rockrstar, romance, love, fear, commitment, loss, second chance, even a little paranormal and it completely captivated me from the get go! Get your Kleenexes handy and dig into this book. I received the ARC for this book and purchased book 1 after because I had to know everything about these characters. I will also be anxiously awaiting the next book I was provided with an ARC in exchange for an honest review. I received the ARC for this book and purchased book 1 after because I had to know everything about these characters. I will also be anxiously awaiting the next book. I am giving Ragan’s Song a 4.8 star rating because not only will I read it again I will keep part of the story in my heart. EXCELLENT Read! For anyone who enjoys a story about second chances, Ragan's Song is a perfect choice. We meet our heroine, Ragan, at the beginning of her journey home. For Ragan, returning to Fairfield Corners is bittersweet. She loves her parents, friends, and family, but secrets of the past threaten to destroy her chance at a new life. Ragan's Song is a lighthearted read...a sweet romance with a touch of paranormal. Wonderful installment to the Fairfield Corners Series. DNF @ 45% and the last 15% of that I skimmed. The characters had absolutely no chemistry whatsoever. I don’t know if I missed it in my skimming but I honestly didn’t see why Ragan had vanished leaving behind a good guy and then didn’t bother to tell anyone she had a baby! Then to get pissy because he wants to fight for his rights as a parent...? Excuse me, say whaaaaat?! Nope. It was a shame because I actually enjoyed the first book and I won’t continue. Really love this new series. Can't wait to read book three. 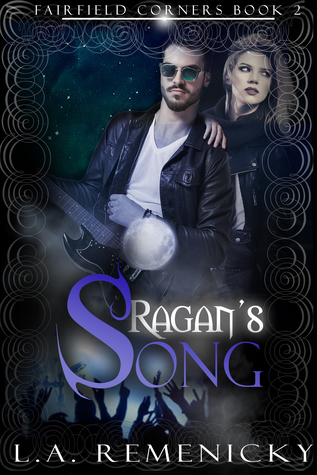 Ragan's Song is the second book in the Fairfield Corners Series but it can be read as a standalone. This is a great second chance love story. And the leading man is a musician. Those two facts had me itching to get my hands on this story. Ragan left town without any explanation three yeas ago and completely devastated Adam in the process. When she returns home she is trying to avoid him and the past. He's moved on, has a new girlfriend, and all is going well in his life. What will happen when he finds out she's in town? Can she keep all of her secrets and the reason she left from him?